SGT Bryce Howard died August 28, 2007, of wounds sustained from an improvised explosive device (IED). Also killed were SFC Rocky H. Herrera and SGT Cory L. Clark, all fellow members of the 864th Engineer Battalion, 555th Engineer Brigade. The three Soldiers were killed in a suicide bombing occurring while they were helping to build a bridge in eastern Jaji, Afghanistan, on the border of Pakistan. This was SGT Howard’s second combat tour to Afghanistan. Bryce graduated from Battle Ground High School in 2001. Later that year, he met his future wife, Amber, and they married in December 2001. Together, the couple had two children: Caleb and Ryen. In a memorial page dedicated to Bryce, his son, Caleb, wrote, “I learned a lot from my dad … I have this one picture of me when I was like 4 or 5, and I was wearing some of his Army gear. Thank you dad! You will never be replaced as being my Hero and my loving, caring dad.” Bryce was an avid snowboard and motorcycle enthusiast. Bryce’s father, Dean Howard, a Vietnam veteran, said, “He was just good-spirited. He had a smile that could get him out of trouble.” Bryce is also survived by his mother, Annette; sister, Casey; and brother, James. SGT Bryce Howard was 24 years old from Vancouver, Washington. 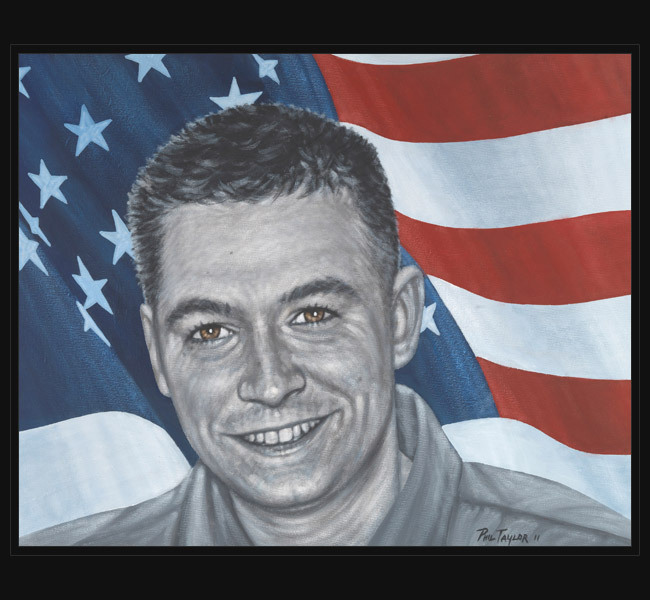 Original portrait was presented to his wife, Amber Howard at an America Supports You- Texas event May 18, 2012, in Amarillo, Texas.